Radiator Blog: Level With Me, a post-mortem / some unnecessary notes / dear players, it's no longer okay to not know how video games work. Chapter 1: The Meat Pack. Each puzzle in this chapter is named after a person whose name is written on a chalkboard near the elevator doors. The experience of interacting with each puzzle kind of mirrors my interactions with that person, and how I feel about that puzzle in general, though it's all kind of exaggerated for narrative effect. The first chamber starts with a cold open. Literally, you start the game in the middle of solving a puzzle. Some players thought this was a bug that loaded a save game as a new game; they're wrong, but that's okay, because in this mod, it's okay if players get confused or misunderstand something. This puzzle also "pushes back" against you and partly unsolves itself -- for puzzles are systems, but in single player games they're generally one-way and rarely reverse themselves. I did these things because other Portal levels weren't doing them. The second puzzle asks you a question -- 5 or 6? (It's from the Star Trek: The Next Generation episode where Picard gets tortured and asked how many lights he sees; which, in turn, is from a similar moment in George Orwell's 1984.) Really game-y gamers will start counting random stuff around the room, because that's how game logic works, there's got to be an answer somewhere even if there's no real logic behind it. But both answers are wrong because the point is just to invalidate you and your choice. Your inevitable punishment is to crawl through a muddy tunnel and get seared by laser beams. The third puzzle uses a tractor beam to pull you inside, which is really the only reason this puzzle exists. I wanted something where the level exerts its agency over you. It's also an upside down room, meaning gravity goes up, which I consider to be the least interesting thing about this room. I just wanted something game-y to break up the two less game-y things, to keep players off-balance. The fourth puzzle is really boring and simple. It's mostly there to a) break up the stale predictability of a difficulty curve, and b) amplify the huge difficulty spike leading up to the fifth puzzle, much like how a small foyer can accentuate a huge atrium. It's also very similar to the beginning of Chapter 9, "The Itch," in Portal 2, which got me thinking along the lines of how levels can represent people. The fifth puzzle is incredibly complicated, and difficult to read / parse. It's there to show that, yes, I can make something difficult but that's not the point of this mod. The key to this puzzle is just sorting out the morass of interlocking parts, but I've been careful to seed most of the necessary mechanisms in previous chambers: cubes falling down light bridge ramps, using lasers to kill turrets, the idea that you might put a cube on one button but you'll have to move it to another button, etc. The most difficult Portal puzzles often involve long distances between portals, a huge possibility space with a lot of portalable surfaces, and pre-mediated up-down movement, so I maximized all three dimensions that I identified. 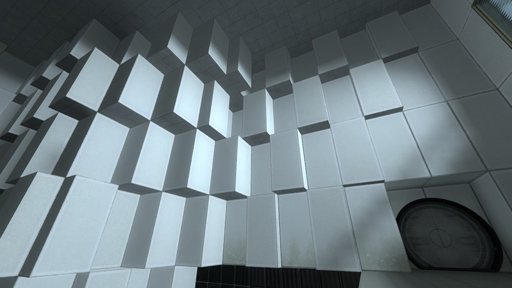 There were some bugs that emerged late in the design, such as how unsatisfying the final solved state is, though luckily some players had the gumption to develop alternative solutions. Chapter 2: Level With Me. I kind of trapped myself into a corner here: the collaboration wasn't as "elegant" as I had hoped. Maybe that speaks to the pain of collaboration and the value of auteurship? I can't really say anything more than the stuff that's already said in the interviews already. Whose level was it? Can a level be interesting even if it's broken? What makes a "puzzle" exactly? Isn't it sad that so many people find exploration to be boring? This was a conclusion / apology, of sorts. I originally recorded a whole audio commentary to accompany it and explain the entire level, but then got convinced it was unnecessary, so I cut everything but the last bit. I wanted to argue for a better definition of "difficulty" and "puzzle" in a video game: There are two aspects to every level, puzzle, or building... how it functions and what it means. That first thing is a puzzle of mechanics, and the second thing is a puzzle of meaning. Both are closely linked, but we fetishize the first too often. Maybe it's too scary to try to solve a puzzle that might not have an answer -- but why don't we think of these conceptual puzzles as "fun"? I don't think I'm demanding much of players because we all already have the ability to read just by virtue of playing. Frank Lloyd Wright could read houses; as Portal players, you know how to read Portal levels, and you know when Portal levels don't make sense. What if we used the "words" of a Portal level in different ways, to say different things? What if we used the "words" that form video games, and used them in different ways? 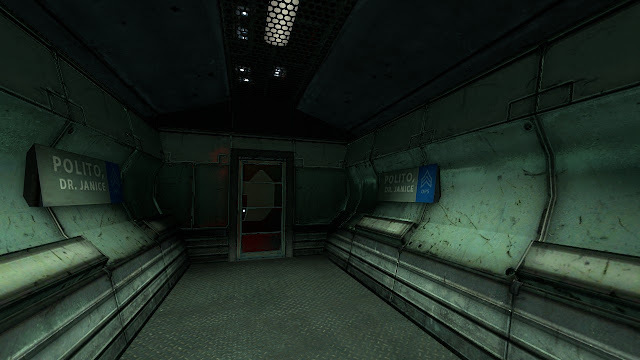 The best, most memorable parts in games -- a dark, quiet hallway leading up to Polito's office in System Shock 2; the gold barrel of Half-Life 1's test chamber that pulsed with promise and danger -- there was no puzzle of mechanics in that. These moments were about the larger puzzle of meaning underneath, the times that left your jaw slightly ajar as you realize you're witnessing something special. Puzzles and mechanics (like narrative, graphics, or sound) are just different materials you can use. (I think Dan Pinchbeck said something like that.) It's the house you build in the end that counts. If that house uses wood but not concrete, that's okay. But if you want to argue that the resulting house isn't actually a house, by your narrow reductionist definition of "house," and it's "totalitarian and unamerican" like Frank Lloyd Wright said about the Farnsworth House, then just know that history, if it remembers any of us at all, will think you were a silly person. Or you can ignore how architecture had the same debate we're having right now. Anyway. It was upsetting how some people didn't recognize the test chamber at the end. 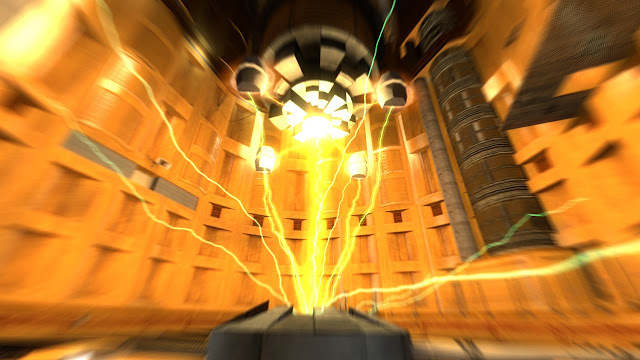 I think someone in the ThinkingWithPortals.com thread called it the "electroshock room thing" or something like that, prompting my eyeballs to detach from their retinas and begin rolling about on the floor. What part do you remember more from Half-Life 1: pushing a button then standing in the test chamber for 5 minutes as the room comes to life around you, or the puzzle where you have to push two crates to jump into the ceiling in Office Complex? A setpiece, a moment... or a puzzle? But this was the first test chamber that preceded all other test chambers! It changed video games forever; every FPS after 1998 lives in its shadow. And far too many people don't know what it is. So maybe it's a problem of education. We force kids to read Shakespeare; we should also force kids to play Myst, Fallout 2, Half-Life 1, Planescape: Torment, etc. and their ability to read and ask questions will be much richer for it. A "Game Studies AP" class might assign System Shock 1 and X-Com. I mean, if you play Battlefield 3 for hours every day, shouldn't you, at the very least, know that its core design is practically untouched from the original Quake Team Fortress mod nearly 15 years ago? And even if we end up leaving this cave, only to realize we're just heading to another cave, won't it be nice to be on your feet?